Leadership is a quality that influences the behavior of the team in order to fulfill the objectives of the organization. Various theories of leadership have been proposed by numerous management experts. It is very important to create a high-performance workforce, and business leaders are required to inspire the members of the organization to work beyond the task requirements. Both transformational and transactional leadership is required in most organizations. It was first introduced by James V Downtown in 1978, which was further developed by a presidential biographer and a leadership expert James McGregor Burns. Transformational leadership refers to a leadership style that becomes a reason for transformation among the subordinates. In this form of leadership, the leader works with his team to achieve a desired change in the organization. The four dimensions of transformational leadership theory are Inspirational Motivation, Intellectual Stimulation, Idealized Influence, and Individualized Consideration. The theory is also popular as management leadership and was first introduced by Max Weber in 1947 and was further developed by Bernard Bass in 1981. Weber believed that the transformational leadership theory is situational. It refers to that form of leadership which emphasizes transactions between subordinates and leaders. The four dimensions of transactional leadership theory are Contingent Rewards, Active Management by Exception, Passive Management by Exception and Laissez-faire. A renowned psychologist Ronald E Riggio recognized four characteristic features of transformational leaders as the 4 Is namely Idealized Influence, Inspirational Motivation, Individualized Consideration, and Intellectual Stimulation that have a substantial influence on a leader’s potential and enriches both the individual and the organization. In spite of their positive attributes, transformational leadership has its shortfalls, since it can be ineffective at certain stages of business growth. Transformational leadership is not equipped to create a management structure and hence cannot operate if the management structure does not already exist. Transactional leadership functions are at its best in organizations where rules need to be followed and has a critical hierarchy where not much emphasis is given on new ideas and innovation. NFL Coaching Centers, Big Corporations and, the Military employ transactional leadership. These leaders set explicit expectations for the understanding of the employees. The issue of contingency comes up frequently in transactional leadership, which means that the employees are awared that the rewards are based on them completing their tasks on time. Transactional leaders employ management by exception, which means that they will not involve or change if the management functions run as expected. Negative exceptions like production quality targets and missing sales goals are immediately attended. In transactional leadership, the organization focuses on one or two leaders, and if the leadership perishes it becomes very difficult to replace. This form of leadership is also very rigid and offers no room for flexibility with goals and objectives. Transformational Leadership addresses issues before they knock at your door, whereas transactional leadership reacts to problems when they arise. Transformational leaders encourage new ideas by transforming the organizational culture, where in transactional leaders function within the existing organizational culture. 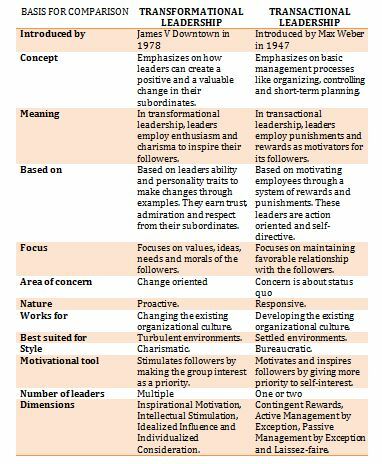 Transformational leaders strive to achieve results from the employees, keeping them invested in projects, which lead to an internal high order reward system; Transactional leaders punish and reward according to the standards of the organization. Transformational leaders appeal to notions and team interests for the success of the organization: Transactional leaders appeal to the self-interest of the employees seeking rewards for themselves. Transformational leadership adheres closely to what is colloquially referred to as leadership, whereas transactional leadership corresponds more to the common notions of management. Transformational leaders exhibit inspirational learning, ability to take higher risks, take tough decisions, entertain newer ideas, and are adaptable, while transactional leaders focus on performance and maintaining compliance with the norms of the organization. Emphasis only on transactional leadership provides a frank tag of the significance of the transactional leadership style. Transactional leadership affects organizational performance by achieving business goals. Research by Obiwuru in 2011 throws light on the role of transactional leaders in improving non-financial performances, especially in terms of improving organizational commitment. Just the way leaders need to employ both democratic and autocratic leadership styles, they also need to be both transformational and transitional according to the demands of the situation.